This guide is a follow-up to similar work previously posted by EmlyDinesh for HD3000 and HD4000. It is based on the excellent research work published by many other well-known Hackintosh gurus such as Pike R Alpha, Toleda, RampageDev, Rehabman and several others (whose name eludes me and for which I apologize) and for which they must be once again thanked. Their work is readily available through a Google search with keywords that include "Azul", "Framebuffer", "HD4x00", etc (brain usage is expected here). I did not do anything other than study this existing literature and experiment with the Intel HD4600 fitted to my Dell Latitude E6440 laptop (SMBIOS MBP11,1 Profile) in order to gain DVI output off an E-Port Plus/PRO2X docking station/port replicator, having previously obtained HDMI output through a binary patch handed over to me (a patch I wanted to understand). The E6440 comes fitted with a VGA port + a HDMI port. 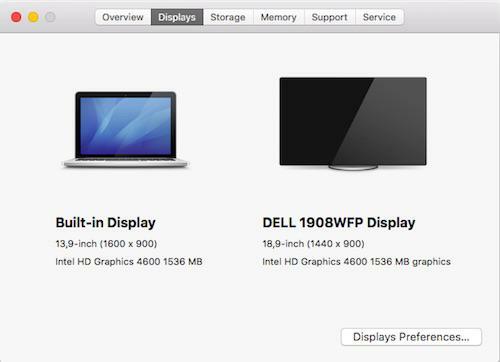 This being stated, the information below should be considered as that -experimentation results- and guidance for experimentations for those seeking to gain DVI, DP or HDMI video output on their Haswell GPU-based Hackintosh. Haswell integrated GPUs include Intel HD (4th gen)/HD 4200/HD 4400/HD 4600/HD P4600/HD P4700/HD 5000 as well as Iris 5100/5200. In OS X, display ports are managed by the framebuffer (FB) kext and for the Haswell family, we're talking about AppleIntelFramebufferAzul.kext (Azul FB). The Azul FB binary file contains various tables associated with each layout, each being identified by its own id (layout-id/ig-platform-id/ etc.) and, usually, about 7 x 16bytes long (I'm not 100% certain of the specific table length and end for each layout). These FB layout ids are the values that most of us have to inject in DSDT or bootloader setup to obtain full graphics acceleration, for instance 0x0600260a for laptops or 0x0300220d for desktops. Let's look at a few tables of El Capitan 10.11.3 Azul FB kext (latest at time of writing), including those specific to the above 2 ids. Using a Hex editor, they're found at offsets 48xxx/49xxx. The 1st 4 x bytes identify the layout id and the rest includes data such as number of ports, VRAM allocation, framebuffer index, port index, connector types, activation delays, etc..
What interests us here, in the matter of display output ports, are the above highlighted parameters. * In terms of "priority", I've read that the byte right after the FB index apparently operates in conjunction with the activation delay: when 2 ports have an identical "priority" value, the port with the highest delay takes precedence, thereby disabling the other. If ports have their own unique "priority", they will be all enabled/available. I'll have to try to hook DVI + HDMI at the same time to confirm this behaviour. One could easily imagine a direct translation of the FB index + its adjacent byte in the layout tables with the display port number as reported in IOReg; that'd be incorrect, as stated in the existing literature. If, indeed, the layout id tables show pairs "00 00" for port #0 and "01 05" for port #5, one would quickly notice that pair "02 04" translate to port #6 and pair "03 06" to port #7. When experimenting with my mobile HD 4600-based Latitude E6440, no HDMI output was obtained OOB with the vanilla Azul FB kext. In fact, the laptop immediately crashed the moment a HDMI cable was hot-plugged. It would not even boot with a HDMI cable plugged in. However, HDMI works perfectly after applying the binary patch to the kext where the hex string 01050900 00040000 87000000 is replaced by 01051200 00080000 87000000. In IOReg, the HDMI display showed attached to FB index #1 with port-number 0x5 and connector-type 0008 0000. We can see that, in the vanilla kext, FB indexes #1 and #2 of layout id 0x0600260A use the same (priority?) byte after the id, the same activation delay and the same connector-type. Building on the gathered technical information from the literature and the above observations, I tried to enable the DVI port off my docking station to use a 2nd DVI screen (lack of VGA support oblige). I first applied the following patch to layout id 0600260A located at offset 49130, keeping the above HDMI patch untouched. This proved successful and brought me DVI output off the E-Port Plus/PRO2X . However, HDMI appeared broken as system froze as soon as HDMI cable got plugged in. That exact same patch is also applicable to Yosemite and Mavericks as well as Sierra. removed 10.13's vanilla + patched Azul kext attachments since some people kept trying to use those in other OS X/macOS versions (unsuccessfully of course...). For DP output, framebuffer #2 (port #6) should be kept (as expected). The prority (?) byte just needs to be set to 12. Can I use the kext on Sierra? Facing HDMI and DVI problems when connecting them both. and one screen is flickering. You can patch the Sierra kext in the exact same way for HDMI. However, I must warn that I've noticed that, since 10.12.3 (can't say for earlier Sierra versions), the DVI patch no longer seems to work for DVI secondary output. My DVI connected screen remains undetected after startup (repeated behaviour off 2 x different types of docking station/port extender). I can only get DVI output by booting my laptop with lid closed, i.e. with single display output to DVI. Of course, you can experiment Sierra with pre-patched kexts from El Capitan but, having never tested this, I cannot state whether this is likely to work or not. I believe you'll probably meet dependancies issues. As such, exert all usual and obvious precautionary steps. DVI output recovered in Sierra and High Sierra with AppleGraphicsDevicePolicy kext patch as described on p5. Thanks for your reply. I'll try other thing I guess. No official support for VGA output on HD4600 & family and no known working patches either. That's why VGA is not even mentioned in the title of the thread. However, I've heard & seen a couple of HD4400 laptops for which VGA output worked OOB. From memory, these were dual-GPU models (Haswell Intel HD + NVidia). You'll find related topics at InsanelyMac. If you're up to it, feel free to experiment with VGA patches yourself using the information above. increased VRAM from 1536MB to 2048MB. Is there a kexttopatch to increase vram. Is this gonna help at somewhere ,i mean with such subperformance gpu ,is it worthy more vram ?